Implicit in all development work is the quest for impact. Positively influencing livelihoods, landscapes and ecosystems is the goal of our work. Effecting such changes is known to require long-term, collaborative efforts, yet many development interventions take place within limited timeframes and scopes. This is where many development practitioners are faced with a conundrum: how to measure results, and satisfy donors’ and funders’ demand for impact reporting, when the typical three-year development project has long expired by the time impacts emerge? One group of researchers from the CGIAR Research Program on Water, Land and Ecosystems; the CGIAR Research Program on Climate Change, Agriculture and Food Security; and the CGIAR Research Program on Forests, Trees and Agroforestry set out to develop a tool that would allow for measuring results as far along the chain of change as possible, but that wouldn’t place significant additional monitoring or administrative burdens on the project manager. They explored the concept of resilience in the context of agriculture, making the basic assumption that an improvement in ecosystem resilience equals impact and will ultimately yield an improvement in human well-being. 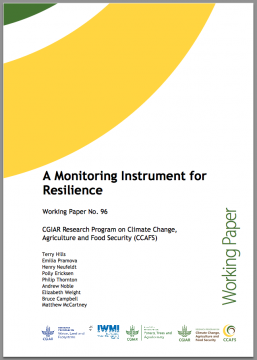 The result is a recently published tool, which enables implementers of development interventions to track and monitor any changes in resilience. Along with changes to ecosystem services, the tool proposes two other ‘categories’ of project outcomes that underpin farm-level resilience: increasing capacity of people to adapt and enhanced livelihoods and farm functioning. 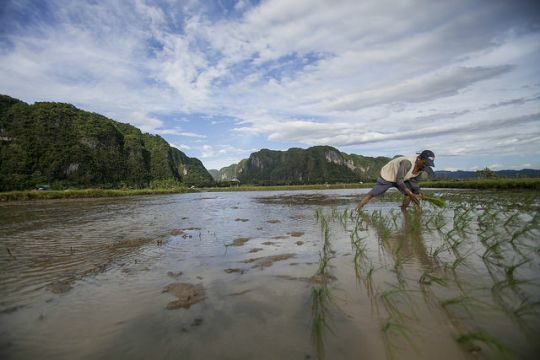 A farmer planting rice in Pangkep, South Sulawesi, Indonesia. Photo by Tri Saputro for Center for International Forestry Research (CIFOR). The design of the tool was influenced by understanding the common restrictions of development projects, such as limited time and budgets, coupled with demand for exhaustive reporting on impact. While thus satisfying funders’ demand for an easily understood impact metric, the tool also allows users to remain rigorous in reporting impact. Project implementers are encouraged to select the indicators most relevant to the change they are trying to achieve, a flexibility that makes the tool widely applicable. In addition, implementers can input data they have already collected, avoiding additional administrative burdens while maintaining scientific accuracy. This monitoring instrument has made great strides in grounding the occasionally lofty concept of resilience. In addition, it offers implementers of development interventions an opportunity to meet an ever-growing demand for impact reporting, without surpassing the scope typically allowed by a development project. While the instrument was designed to balance a rigorous framework with a high degree of flexibility, it should, like all such tools, be considered only a guiding document until a critical mass of users has trialed the instrument and provided feedback on how it can be improved. “Until tools like this one have been tested, refined and brought into more common use, the challenges of measuring and reporting changes to resilience will remain elusive for many of us,” concludes Hills.